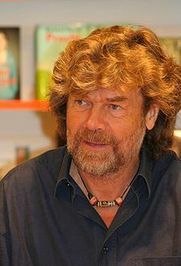 Reinhold Messner (born September 17, 1944) is an Italian mountaineer and explorer from South Tyrol, often cited as the greatest mountain climber of all time. He is renowned for making the first solo ascents of Mount Everest without supplemental oxygen and for being the first climber to ascend all fourteen "eight-thousanders" (peaks over 8,000 metres above sea level). He is the author of at least 63 books (in German, 1970–2006), many of which have been translated into other languages. Is this you? Let us know. If not, help out and invite Reinhold to Goodreads.